So you want to be able to fletch? Well, Fletching is a skill that can make you save a lot of money. When Fletching is combined with Runecrafting and Magic, it is a good way to make money using skills. First off, you'll need a knife and any type of hatchet, as long as you have the required woodcut level to use it or money to buy logs, but this is not recommended for a while as you can cut them just as fast and you will lose money this way. Behind the bank are a few normal trees that are normally empty so you can practice your low-level fletching here. 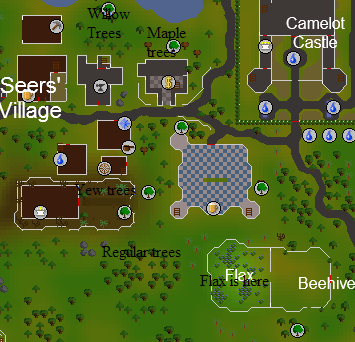 Seers' Village might be a small town but it is regarded as the Fletching Capitol of RuneScape since every single fletchable logs tree can be found near by. Also the most used flax field for making bow strings and a spinning wheel are here. This is a place for high level fletchers, because there is flax. Also you can find yew trees, and even magic trees here. 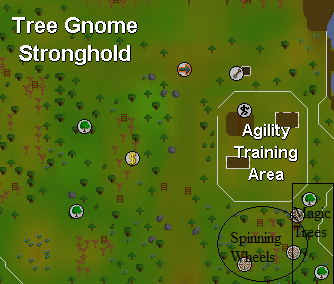 It is not used as much as Seers' Village, but mostly for woodcutting. You may find the flax and spinning wheel quite empty. Ok, now that we have that whole intro-to-fletching out the way, let's start. From here on out I will recommend places for you to level at and tell you how many objects you will need to fletch. I will give you a few choices however and you can do whatever you think will be better for you. After completing starting Mourning's End Part 1 you can enter Lletya and use the bank to store flax and magic logs. Fletch the magic logs into bows (u) and use the Lumbridge spinning wheel to spin all your flax into bowstrings to fletch into bows. This place is commonly used by high level players because of the requirements to get into Lletya. 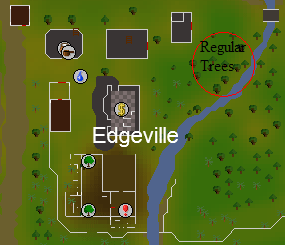 Ok, so now I recommend you go to Edgeville, and if you look on the map of the city you should see that behind the bank there are quite a lot of normal trees. Get out your hatchet and your knife and start cutting the trees until all of them are gone then fletch all the logs into Arrow Shafts. Since they are stackable you won't have to worry about banking them. You will need to make 3,497 of them. That may seem like a lot, but you get 15 Arrow Shafts per log so it goes by pretty fast. From here I would stick with normal Longbows until Oak Longbows as they give about the same experience as an Oak shortbow, but are faster to cut and can be found closer to a bank if you're cutting. As with before do not string them but leave them unstrung. You will need to make 699 Normal Longbows before reaching 25 fletching. Stick with making Oak Longbows (u) until 40 fletching as they seem to be the best unless you're going to buy your logs. 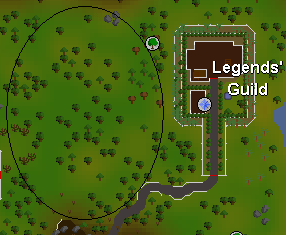 I recommend cutting oaks at the 2 trees west of Varrock as you can bank them. You will need to make 1,176 before you reach 40 fletching. From here on, I would go to Seers' Village as that is the best place for people your level and up. 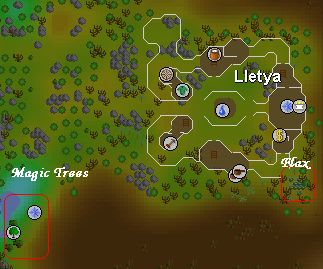 If you're cutting your own logs, cut in the spot on the map above for willows. Now make 3,082 Willow Longbows (u) for 55 fletching. Now this is one of the longest and hardest stretches. From here on out you are going to be stringing all of your bows as they give much better exp that way. Now you will need to make 4,881 Maple Longbows (s) until level 70. Instead of fletching all these bows and stringing them, you could buy twice as many logs and just fletch the bows. Based on Grand Exchange prices, this would greatly reduce the price. This strategy is recommended if you don't have millions of coins lying around, but it may be slightly slower. Ok, now you are at one of the hardest parts of leveling fletching. You will need to make 8,323 Yew Longbows (s) before level 80, all I can say is good luck because that is a lot of bows. Now you have a choice: you can either stick with Yew Longbows or go to Magic Shortbows. If you're buying the logs, I recommend Magic Shortbows as they give more experience. However, if you're cutting your own logs then even at 99 woodcut it's faster to use Yew longbows instead of Magic Shortbows, as Magic Logs are much slower to cut. If you decide to stick with Yew Longbows you will need to make 8,484 of them. If you decide to move on to Magic Shortbows you will need to make 7,620 of them before level 85. Nice work, you made it! Now I would go do something else for a while -- maybe alchemy, or sell all those bows you just made and buy yourself something nice, or train other skills. Only serious fletchers need to continue beyond this point. If you are really serious about getting to level 99 fletching, you will need to make 53,420 Magic Longbows! Yeah, I know it's a lot but don't be put off by it. You can do it and remember this will make you millions if you want it to. Congratulations! You are now among the best fletchers in RuneScape! Many people will be willing to trade Yew Logs and Bow strings for Yew Long-bows. This way you can get experience and not spend anything. Withdraw 14 bows (u) using the 'withdraw x' option. Withdraw 14 bow strings using the 'withdraw x' option. Make the 14 bows (s). Withdraw 14 bow strings using the 'withdraw all' option. Deposit the 14 bows (s). Withdraw 14 bows (u) using the 'withdraw all' option. When stringing, have 1 random item (eg. Dragon Longsword) in the top-left square of your inventory and an Unstrung Bow in the opposite corner. When withdrawing withdraw 10 Bows, then click 3 times. Then select to withdraw all Strings. Note: You can use either Tip #2 or #3 to string your bows.